Text papers are Fabriano Ingres and Hahnemuhle Bugra. Stamps hand-carved by the artist. Calligraphy and stamping done in gouache. Papier machè box was spray-painted and decoupaged. 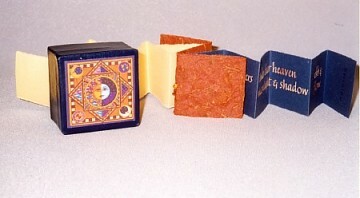 Book 2¼″ x 2¼″ x 1½″(5.7cm x 5.7cm x 3.8cm).